This product is case packed in quantities of 10 per carton. A break carton fee of $11.00 will be applied to orders that are not placed in case denominations of 10 units. 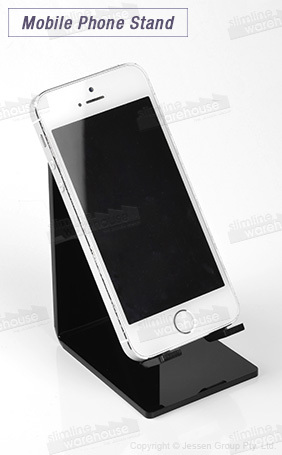 This acrylic phone holder helps beautifully display mobile devices to make them even more attractive to customers. A cut out in the stand helps hide charging cords, helping keep devices powered whilst maintaining a tidy looking display for a professional look. The mobile phone displays great for retailers to display smartphones as well as other small merchandise in news agents, cafes, bakeries, and more. The acrylic display stand, acrylic phone holder is made from 3mm thick black acrylic, providing a durable display with a stylish design that works well in any location. The small footprint of the stand makes it easy to place multiple holders near each other or place other merchandise near the display. The angled shelf positions phones to be more accessible to customers as well as making them easier to see from different vantage points. Click here to see the massive online catalogue, full of hundreds of different products in a variety of categories that can be use to outfit your business in style without breaking the budget. For over 20 years, Slimline Warehouse has been providing Australians with top-notch products at affordable prices. Same day despatch is offered with most in stock items that have been purchased prior to 1pm EST out of our warehouse. Order for your business today anywhere in Australia, including Sydney, Perth, Canberra, Melbourne, Adelaide, Brisbane, Gold Coast, Bendigo, Cairns, & Hobart!